There are a limited number of volunteering tickets and they go on a ‘first come first serve’ basis according to when we receive your payment. 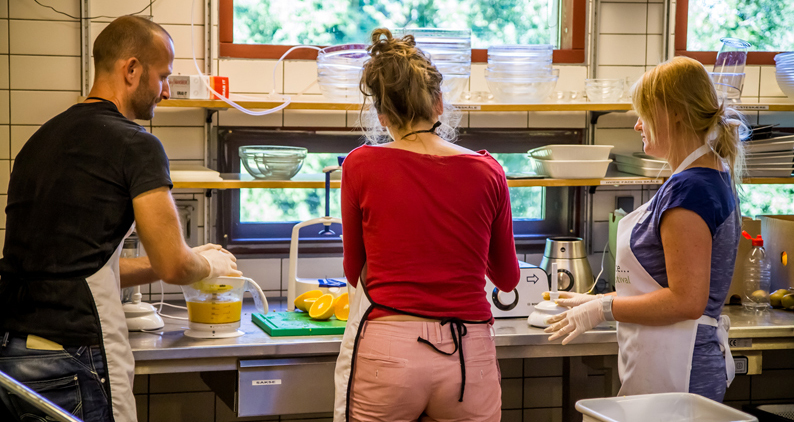 Kitchen volunteers should arrive at least 1 hour before festival opens and join the staff meeting in the kitchen at 13.00 am. During the meeting you will be given some general information and instructions about the procedures, ‘dress code’ and receive your schedule. You will work in the kitchen preparing the food and doing things like washing the produce, carrying boxes, opening durian and jackfruits, sorting out the fruit, rinsing and chopping vegetables and fruit, blending smoothies, juicing oranges, taking out the garbage, filling up jugs with water, preparing meal cards and arranging the food in the dining hall. You will also be doing household duties around the kitchen and dining hall like wiping tables, taking out the trash, cleaning the kitchen after use, collecting trolleys with dirty cutlery, collecting dirty kitchen equipment from the kitchen, washing things by hand that does not go in the dishwasher, putting back clean cutlery and most importantly washing up all the dirty dishes from the meals. The hotel has a large dishwasher where you have to arrange the plates, cups etc. in large trays before they are placed in the dishwasher. You will also have to wash the floor in the kitchen and wipe surfaces to make the kitchen ready for the next meal. You should be open to any kind of cleaning task that is related to the kitchen and the dining area, including cleaning up when people eat outside. If you choose to work as a full time volunteer you will have to work at 8-9 meals at the festival and you will get a special discount off the festival ticket price in return (there is no extra discount if you are a student or retiree). That means you will have to work about 2 hours each meal depending on the complexity of the meal. You will be working until the meal has been served and only finish when the head chef or kitchen coordinator gives you permission to leave. As a full time volunteer you will therefore only be able to join a limited number of presentations and activities. We will try to meet your requests if there is something you really want to hear or participate in but we just cannot guarantee it. If you choose to work as a part time volunteer you will have to work at 4-5 meals at the festival and in return you will get a special discount off the festival ticket price (there is no extra discount if you are a student or pensioner). This means that you will have to work about 2 hours each meal depending on the complexity of the meal. You will be working until the meal has been served and only finish when the head chef or kitchen coordinator gives you permission to leave. As a part time volunteer you will therefore only be able to join some of the presentations and activities. We will try to meet your requests if there is something you really want to hear or participate in, but we just cannot guarantee it and you can make your requests when you fill out the registration form.